Oregon State University scientists and a team of others have discovered plastic marine debris played a key role in transporting non-native species after the March 2011 Japanese earthquake and tsunami. The findings suggest that expanded coastal urbanization and storm activity, including the recent hurricanes and floods around the world, and predicted future enhanced storm activity due to climate change, could mean that the role of marine debris as a novel vector for invasive species may be increasing dramatically. The towering tsunami that devastated Japan six years ago also unleashed a very different sort of threat onto the distant coastline of North America: a massive invasion of marine life from across the Pacific Ocean. Hundreds of species from the coastal waters of Japan — mostly invertebrates like mussels, sea anemones and crabs — were carried across the Pacific on huge amounts of floating debris generated by the disaster, according to a study published Thursday in Science. 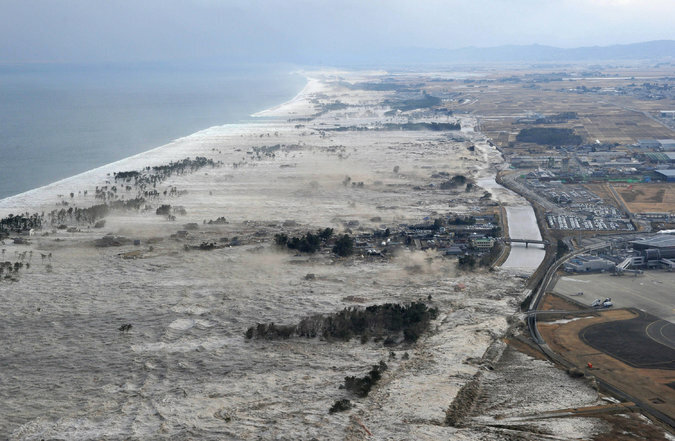 Less than a year and a half after the enormous earthquake and tsunami on March 11, 2011, left more than 18,000 dead or missing in Japan, the first pieces of wreckage began washing up on the shores of Canada and the United States. To the surprise of scientists, the debris was covered with sea creatures that had survived crossings that in some cases had taken years. 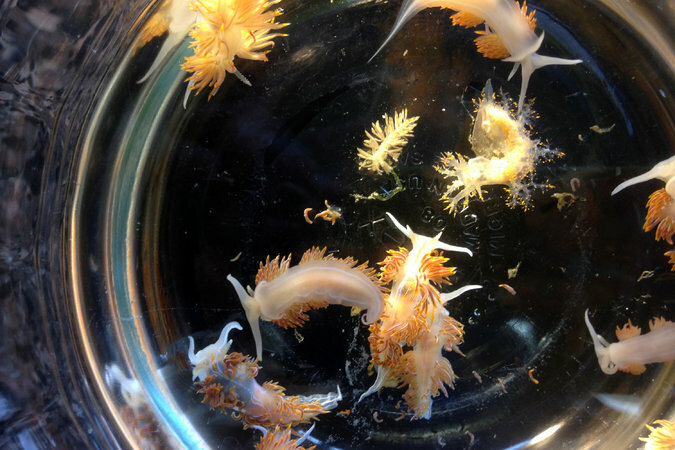 Sea slugs brought to Oregon by a Japanese derelict vessel from the Iwate Prefecture. The study’s authors say it is too early to tell how many of these tiny invaders have gained a foothold in North American waters, where they could challenge or even displace native species. While such “rafting” of animals across oceans happened in the past, the authors say the Japanese tsunami is unprecedented because of the sheer number of organisms that it sent across the world’s largest ocean. And this points to one of the main findings of the study: that this mass migration was the result of not just the huge natural disaster, but changes in human behavior. Such large numbers of marine animals were able to cross the Pacific because they rode on debris — made of materials like plastic and fiberglass — that proved durable enough to drift thousands of miles. These synthetics, the use of which has taken off around the world, can stay afloat for years or even decades. The debris that was dragged out to sea by the 2011 tsunami formed an unsinkable flotilla capable of transporting a large population of organisms across the world’s largest ocean. Debris thought to have floated from Japan was prepared for inspection at Hatfield Marine Science Center at Oregon State University in Newport, Ore.
“We have created a new ecological process, the process of mega-rafting,” said Steven L. Chown, a professor of biology at Monash University in Australia, who was not involved in the report, but wrote a commentary that also appeared in Science. This flotsam ranged in size from coolers and motorcycle helmets to entire fishing boats and even larger objects, teeming with living sea animals that were native to the coastal waters of Japan, but foreign to North America. 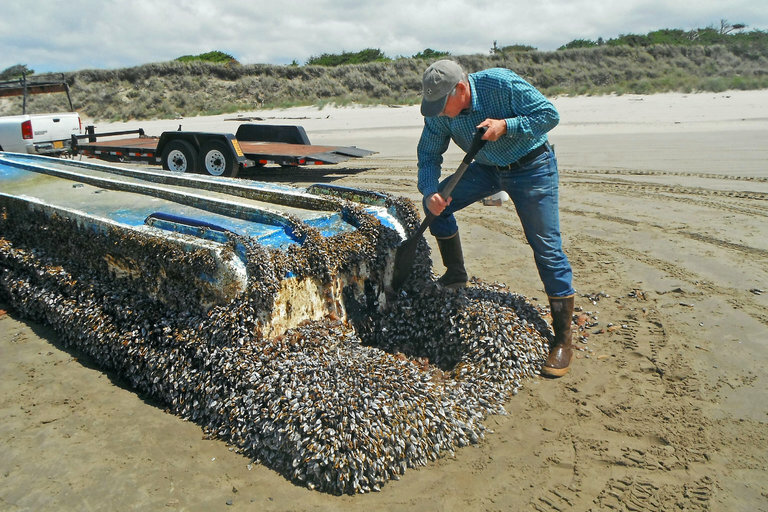 John Chapman inspected a derelict vessel from Japan that had washed ashore on Long Beach, Wash. Hundreds of species from Japanese coastal waters were carried across the Pacific on floating debris generated by the 2011 tsunami. The larger the object, the more animals it carried. One of the first pieces of tsunami debris that appeared was a 180-ton floating dock that washed ashore in Oregon in June 2012. It was carrying a diverse mini-ecosystem of more than 120 different species. “This was our first heads up, that this was the vanguard of what might be coming from Japan,” said one of the report’s co-authors, James T. Carlton, a professor emeritus of marine sciences at Williams College. Dr. Carlton called it remarkable that such a wide range of species — which also included barnacles, worms and tiny filter-feeders called bryozoans — could survive the journey across the northern Pacific. In many cases, these passages took years, longer than the life spans of the individual organisms. The authors concluded that not only did these creatures adapt to an open ocean where food was scarcer than in rich coastal waters, they were also able to reproduce, in some cases for at least three generations, before reaching the North American coast. “We found that hundreds of species could survive for multiple generations at sea,” said Dr. Carlton, who is a former director of William’s Maritime Studies Program in Mystic Seaport, Conn.
To conduct the study, the authors relied on more than 200 volunteers, including state park rangers and beachcombers, to find and examine some 634 pieces of debris that washed ashore from 2012 to earlier this year. While there was concern in the early days that some debris might have been contaminated from the nuclear accident at Fukushima that was caused by the tsunami, Dr. Carlton said such worries quickly eased after tests showed no traces of radioactive contamination. 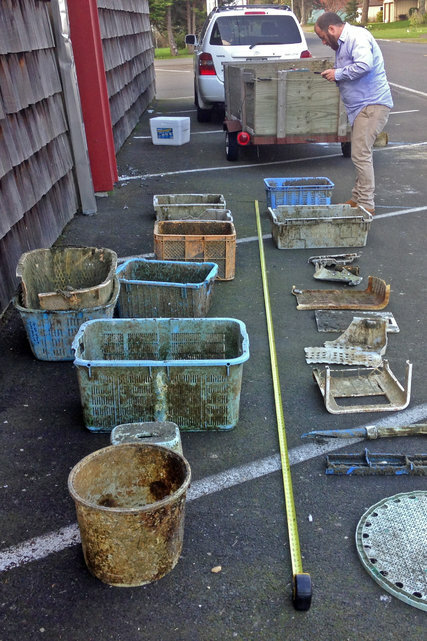 The washed up objects were found to carry 289 invasive species from the western Pacific. While most were invertebrates, a few vertebrates survived the journey, including a small number of emaciated fish that were trapped inside the water-filled hulls of half-sunken fishing boats. Researchers tracked invertebrates and fish that traveled thousands of kilometers across the Pacific on debris such as boats, buoys, and fragments of docks. All told, thousands of pieces of debris from Japan washed up on North American coasts from Sitka, Alaska, to Monterey, Calif., and as far afield as Hawaii. Since the authors and volunteers were only able to inspect a fraction of these objects, Dr. Carlton said he believes hundreds more species likely made the crossing. It is unclear how many of these will actually gain a foothold in North America. It takes years for an invasive species to establish a viable population, and these may be hard to spot on so long a stretch of coastline. Species that do prosper can cause enormous environmental and economic damage, especially if they supplant native species upon which coastal communities depend for livelihoods. The study concluded that such disruptions will become more frequent as the use of plastics and other synthetics proliferates. Nor does it take an event as rare as a giant tsunami to launch the next invasion fleet. Dr. Carlton pointed to Hurricane Irma, which blew large amounts of plastic debris from devastated Caribbean islands onto Florida’s beaches. “We have loaded the coastal zones of the world with massive amounts of plastic and materials that are not biodegradable,” he said.